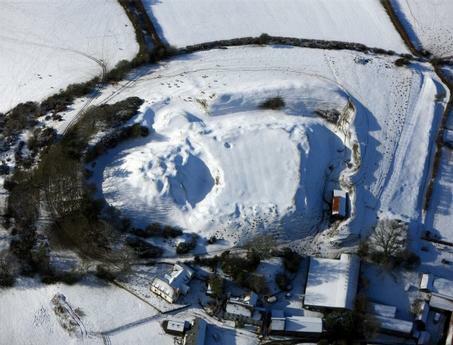 Archaeologists have discovered ancient remains after they were "brought back to life" by the snow covering the landscape. 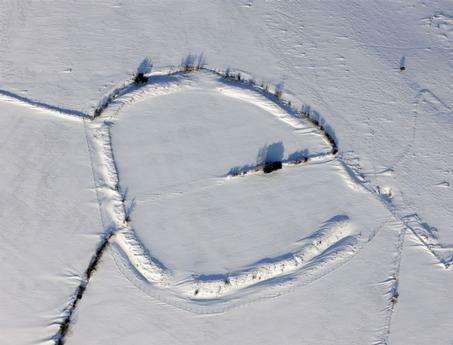 Settlements dating back 4,000 years were only found because just the right amount of snow fell on the countryside. Experts were flying over the landscape in a light aircraft when they spotted the Bronze Age remains below. A combination of the snow and the low sun in the sky at this time of year provided ideal conditions to plot the sites for the first time. 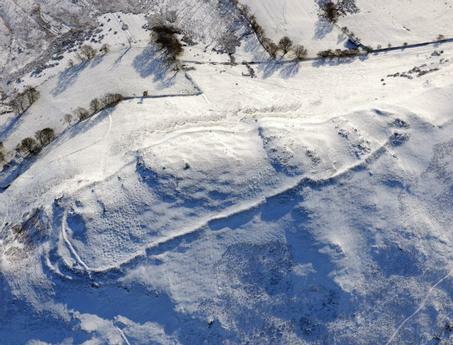 Archaeologist Dr Toby Driver said: "The snow provides breathtaking conditions for our aerial reconnaissance. 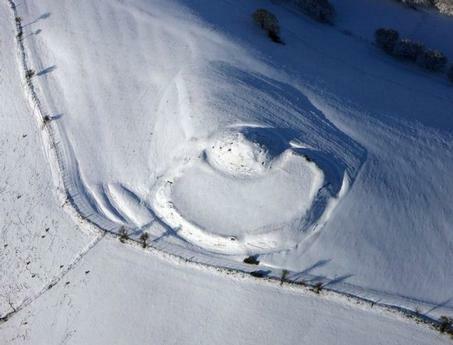 "Snow evens out the colours of the landscape allowing complex earthwork monuments to be seen more clearly and precisely." The experts on board the four-seater Cessna identified up to 40 ancient earthworks hidden beneath centuries of growth in Mid and South Wales. They included a 20-metre wide burial mound on common land at Ogmore-by-Sea near Bridgend and a moated site at Llangorse lake near Brecon. The team were also able to photograph earth works which they already knew about including the remains of a Norman castle at Painscastle near Builth Wells. Others they were able to map again were the Castle Bank hill fort near Llandrindod Wells, Crugerydd castle near the A44 in Powys and Coedcae Gaer hill fort near Bridgend. The new discoveries were recorded by the experts from the Aberystwyth-based Royal Commission on the Ancient and Historical Monuments of Wales. 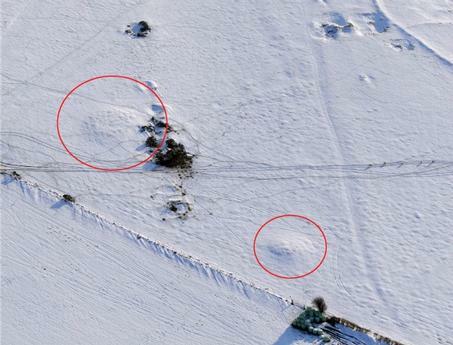 Dr Driver, a team leadrer with the commission, said: "The right depth of drifting or melting snow helps to show up slight differences in topography which can highlight an archaeological site. "It's as if the snow has brought them back to life. "It has also highlighted well-known monuments like Painscastle medieval motte and bailey together with previously unrecorded earthworks." The Royal Commission has been using aerial reconnaissance to identify ancient sites for the last 25 years. But the recent Arctic conditions which have seen snow laying on the Welsh hills for weeks have given the team a new way of unlocking the mysteries which cannot be seen from the ground. Dr Driver said: "Aerial archaeology remains one of the most powerful tools to uncover and document this lost heritage. "So far well over 5,000 new archaeological sites have been discovered across Wales in 25 years of flying. "We can now appreciate that Wales was intensively farmed and settled from the Neolithic era 6,000 years ago."